Make handling ColorCode more easily. 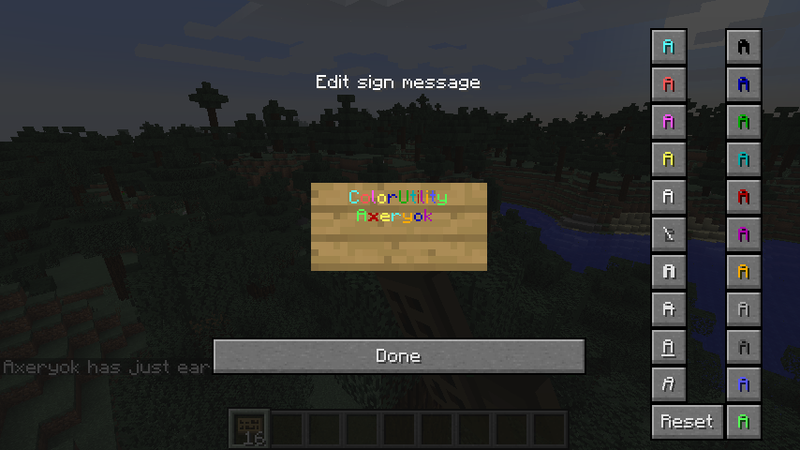 ColorUtility makes minecraft receive "§" character. 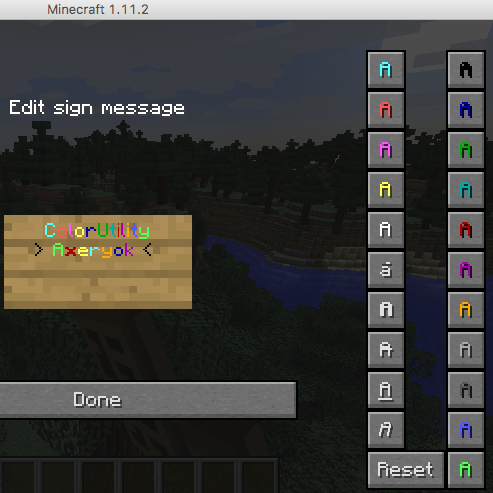 When you edit signs or books, Useful colorpad support you to edit them with color string. ColorUtility works in Server and Client. If you have to paint text and make text bold or italic at the same time, you should push ColorButton before push TextFormButton. 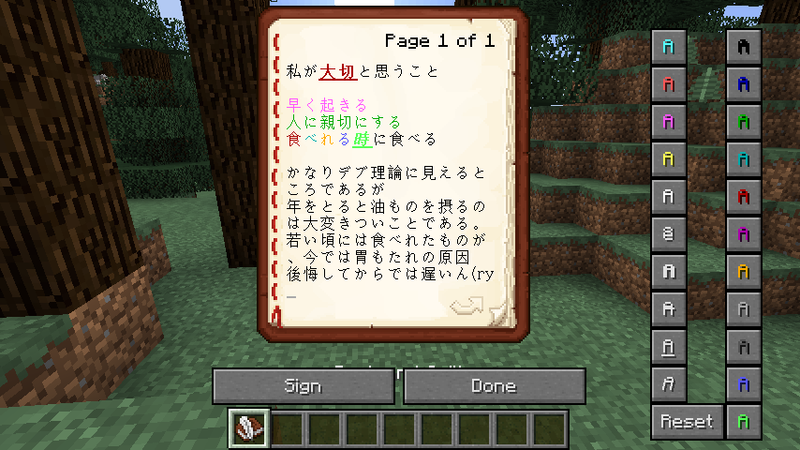 ColorUtility are also distributed on http://forum.minecraftuser.jp/viewtopic.php?f=13&t=24394(Japanese). When the ColorUtility jar file is installed on the server, there will be warnings on startup. I'm using Forge 1.12.2 build 2795. Functionally it does seem to be working and I'm using it with SmoothFont mod to get the clarity in the colored text also. Can i Configure the mod so that the side buttons don't show up? Why: I am planning a roleplay series and i don't want everyone to know wich mods i am using. Can i configure that the buttons on the side of the book and the sign don't show up? Because i am working on a Roleplay Series and don't want it to be obvious wich mods i am using? Is this compatible with Quark? Can people without the mod join servers with it? Some servers forbid clients to use color code in chat and kick for its reason. So I will not implement color pad on chat. If you would like to use formatting chat, "tellraw" command will be good solution. In other situations, colorutility accepts "§" character with copy. I am using it on server and client 1.12.2 and it is not working i just get normal signs. Please make sure that both server and client have installed colorutility. In server/client forge-1.12.2-14.23.1.2555, I checked that they works. Probably you have sign-edit-extension mod in client which conflict with ColorUtility. This problem of conflicting is too difficult to fix.sorry. Can't download, throws out an error. Curse's addon redirect site for file downloading is DOWN. Both client and server should be installed. if sever isn't installed, it ignores color code. If only Curse would separate the client and server mods.